Knowingly, director Aleksey Uchitel opens his latest politically motivated thriller with an infinity symbol flashing and twisting on screen, emerging from the self-explanatory title, Break Loose. It's an image that summarizes the Sisyphean struggle that unfolds over the next hour-and-a-half quite succinctly, denoting the desire to escape counterproductive cycles of repetition, both socially and economically. Commenting on Russia's Millennium Development Goals by having the story take place in December of 1999, Uchitel sets up an implicitly inescapable cycle of conflict between the disillusioned, sovereign soldiers working for the Russian Special Police Squad and the elite criminal element that oversees wealth and commodity control. Though the protagonist, Herman (Aleksey Mantsygin), is a member of OMON, idealizing nationalistic obligation, his career disposition — fighting protesters and keeping drunks off the streets — holds little social value or hope for the future, merely criminalizing those already marginalized by an expansive wealth divide. He and his buddies, touring the streets at night, looking for some fun to escape the drudgery, inadvertently alienate an affluent club owner and his interchangeable henchman, starting a fight in a Millennium-inspired dance bar that escalates into a spiral of vengeance and one-upmanship. Making matters worse is Herman's insistence on fulfilling noir obligations by wooing Aglaya (Vilma Kutavichute), the girlfriend of Boots, said shady club owner. 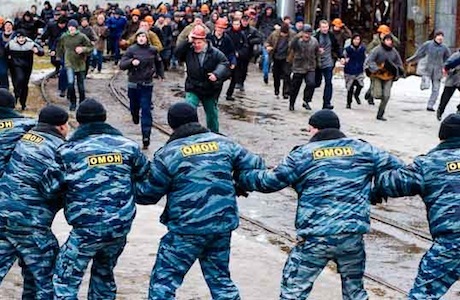 As Break Loose unfolds, the endless array of street fights and covert stabbings bleed together, along with the many sequences of OMON arresting protesters and setting up aggressive blockades to keep them away from the closed factory that once employed them. Though both sides of the conflict, neither of whom would be qualified as "good" guys, react aggressively to each attack, there's a pained redundancy about it all, which is verbalized mostly during the quieter moments between Herman and Aglaya, while planning to escape to Moscow, where they can (hopefully) live free from daily conflict. These exchanges define what's ultimately a superficial relationship. Herman and Aglaya do little more than stare at each other before indulging in frenzied coitus, making the riskiness and silliness of their hormonal relationship seem like little more than a plot obligation to inspire dramatic effect once the climax solidifies the polemical subtext. Similarly, save the obvious camaraderie between the main soldiers, there's little in the way of complex characterizations or narrative developments beyond the obvious street thug turf war redundancy. What Uchitel is more concerned with are the pointed moments following the New Year's celebration ringing in 2000. A television broadcast denotes a need for new political blood and social change, which, considering the destructive, almost anarchic nature of the warring gangs, would hopefully help everyone find a bit of peace. However, as we know all too well, not all change is for the better, which is what makes the tragic resolution of Break Loose work as an indictment of the current socio-political spectrum in Russia, which is presently a topic of discussion throughout the world. In this — the commentary — Break Loose excels as a relevant and biting text, tying past to present with a clever allegory. It's just unfortunate that the basic plot machinations and surface narrative elements do little to maintain interest.